Last night The Tragically Hip, an iconic Canadian band, played what will probably be their final concert. The lead singer, Gord Downie, has terminal brain cancer, and due to public demand, the CBC suspended their Olympic coverage to broadcast the concert on radio and TV as well as streamed it online so that everyone could watch. Across the country, towns and cities held public viewings in squares and parks. Bars turned off the sports, and tuned in. 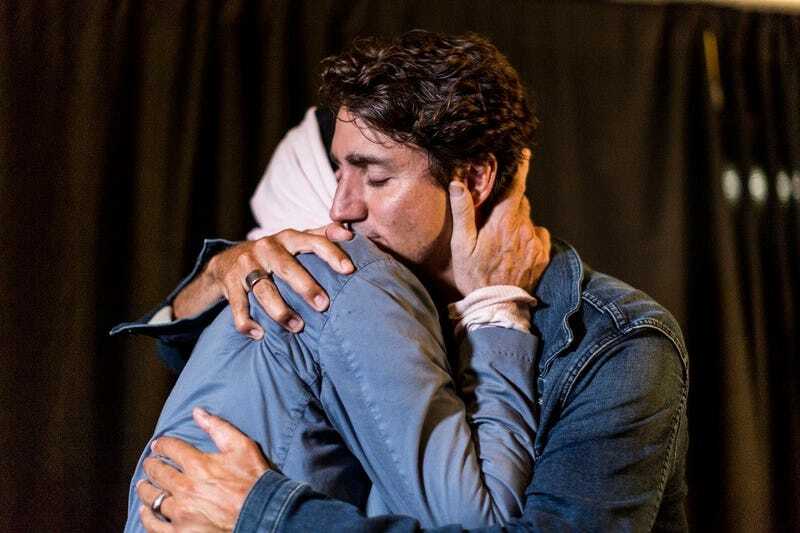 The Prime Minister attended, and went to meet the band beforehand, which is where the above photo of him hugging Gord Downie came from. During the concert, Gord Downie twice stopped to address the Prime Minister, specifically about issues affecting the Aboriginal peoples of Canada. “Well, you know, prime minister Trudeau’s got me, his work with First Nations. He’s got everybody. He’s going to take us where we need to go,” Downie said from the stage. Thank you to the Prime Minister for coming to our show, it really means a lot to all of us,” he said. “We’re in good hands, folks, real good hands. He cares about the people way up North, that we were trained our entire lives to ignore, trained our entire lives to hear not a word of what’s going on up there. And what’s going on up there ain’t good. It’s maybe worse than it’s ever been, so it’s not on the improve. (But) we’re going to get it fixed and we got the guy to do it, to start, to help. I imagine that there were Trudeau hating heads exploding all over the country after that one. I am just waiting for the right wing blogosphere to react. There’s no way in hell that Ezra Levant, for example, with his kneejerk hatred for the PM is going to be able to let it go, and I expect he will make a jackass of himself as per usual.